Kevin Chlarson is a civil litigator who concentrates his practice in the areas of: business and commercial law; alcohol beverage law; employment law; insurance law; and general litigation. He has significant trial experience representing clients in Kentucky’s federal and state courts. He has successfully represented clients in all manner of business disputes including, but not limited to, the following: shareholder and partnership disputes; breaches of fiduciary duties; enforcement of non-compete and non-solicit covenants; fraud and tortious interference with contracts actions; violations of employee non-discrimination statutes; and breach of contract claims. Kevin has developed a broad practice focused on Kentucky alcohol beverage regulation. He is frequently consulted by clients with alcohol licensing and regulation issues and questions in Kentucky and other states. He has represented licensees (retailers, distributors, and wholesalers) in federal and state courts and Kentucky state administrative proceedings in litigating: the constitutionality of Kentucky statutes restricting the sale of alcoholic beverages; breaches of beer distributor contracts; and liquor license application denials by the ABC Board. 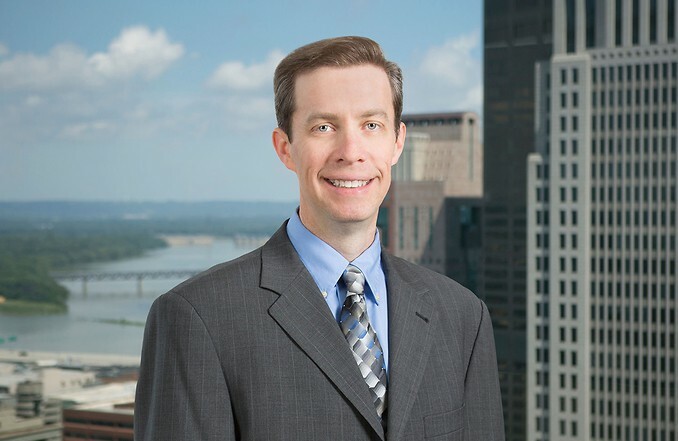 Kevin has appeared for clients in federal and state courts at every level of civil litigation, from appellate arguments before the Sixth Circuit Court of Appeals and the Kentucky Supreme Court, to serving as lead trial counsel in Kentucky and Ohio federal and state courts, to supervising all aspects of pretrial litigation. He also has significant experience representing clients in arbitrations and Kentucky administrative law proceedings, including proceedings before Kentucky’s ABC Board, Cabinet for Health and Family Services, and the Workers’ Compensation Board. Successfully obtained a temporary injunction for clients against Kentucky governor in response to the governor's executive order removing client from position as a trustee for the Kentucky Retirement Systems. Upon final resolution of the case merits, our clients were awarded their attorneys' fees and costs by the trial court. As lead trial counsel, successfully defended and obtained favorable trial verdicts for: (1) the former general manager of a Kentucky beer distributor sued in Kentucky federal court by a company shareholder seeking a multi-million dollar judgment against him for breaches of loan guarantees and fiduciary duties owed to the company; (2) a local Louisville contracting company sued in state court for fraud and breach of contract; and (3) the estate of an Ohio businessman countersued in Ohio state court for breach of contract. Defended and served as trial counsel for a Kentucky distributor of a multi-national orthopedic manufacturer involved in multi-jurisdictional litigation (one case in Kentucky state court and one in Tennessee federal court in which the plaintiff was seeking damages in excess of $250,000,000) for claims of breach of contract, trade secret violations and tortious interference arising out of a rival orthopedic manufacturer’s acquisition of a competitive distributor. The case was successfully resolved after a three week jury trial in Kentucky state court in Louisville. Served as trial and appellate counsel in successfully obtaining a quiet title judgment for an Ohio coal holding company in a multi-million dollar mineral rights dispute. Represented a multi-national orthopedic manufacturer in the enforcement of non-compete agreements throughout the country against former employees who left the company to join competing medical device manufacturers and attempted to take customer accounts and proprietary information to their new employers. Defended a Kentucky oil transport company in a multi-million dollar dispute brought by the former owner over the company’s stock ownership, and successfully obtained summary judgment for the client as the rightful owner of the company’s stock. Represented individuals and corporate entities who developed and managed low income housing tax credit properties throughout Kentucky against claims of breach of contract and breach of fiduciary duties by state and national financial institutions, who were the lenders and investing limited partners in the property projects. Represented Kentucky owners-franchisees of a regional restaurant chain in a dispute with their co-owners over breach of employment and franchise agreements, obtaining a favorable resolution of the case for the clients. Represented employers in federal and state court cases involving discrimination, retaliation, unfair competition, and FMLA violation claims. Co-lead counsel in representing a Northern Kentucky alcohol retailer in opposing the Kentucky grocery store industry’s attempt to have the federal courts eliminate Kentucky’s prohibition against liquor and wine sales in grocery stores and convenience stores. Successfully briefed and argued the client’s case before the Sixth Circuit Court of Appeals, which upheld the prohibition after the federal district court ruled that the prohibition was unconstitutional (Maxwell's Pic-Pac, Inc. v. Dehner). Co-lead counsel in representing Louisville bar and restaurant businesses in multiple case before the Kentucky Supreme Court over the issue of the Commonwealth’s requirement that bars must be located no less than 700 feet apart. In the first case, Louisville/Jefferson County Metro Gov't v. TDC Group, LLC, the Supreme Court upheld the Court of Appeals’ decision in our client’s favor that the State ABC erred in measuring the distance. In the second case,Louisville/Jefferson County Metro Gov't v. O'Shea's-Baxter, LLC, the Supreme Court ruled that the 700 foot rule was unconstitutional. Both decisions overturned the Kentucky ABC Board’s denial of liquor licenses to the represented clients. Co-lead counsel representing a state beer distributor in an arbitration proceeding to determine the monies owed to it for the termination of certain beer brand distribution rights by a national beer manufacturer, obtaining a favorable decision of the case for the client. Co-lead counsel in representing a state beer manufacturer sued by a former distributor for termination of certain beer distribution rights in Western Kentucky, obtaining a favorable resolution of the case for the client. Co-lead counsel in representing a Kentucky alcohol wholesale association before the Sixth Circuit Court of Appeals and the Western District of Kentucky in defense of Kentucky’s wine laws. Counsel for Kentucky liquor retail chain in dispute with local municipality when the city attempted to levy a local alcohol tax targeted at one of the retailer’s Louisville locations, resulting in the municipality deciding to not levy the proposed tax. Counsel to clients on the regulatory and distribution effects of changes to federal, state, and local laws impacting Kentucky alcohol licensing and distribution. Kentucky Humane Society, Tuxes and Tails, Fundraising and Organizing Committee and Legal Advisory Committee for six years.